(Phys.org)—Leslie Rosenberg, a physicist with the University of Washington has published a paper in Proceedings of the National Academy of Sciences, describing the current state of research that involves investigating the possibility that axions are what make up dark matter. He also offers some perspective on the work suggesting that at least one project is likely to lead to either proving or disproving that axions are dark matter. For several years now, scientists have been hard at work trying to detect WIMPs, the thinking has been that if they can be detected, then it would go a long way towards proving that they are what makes up dark matter—the theoretical stuff that is now believed to make up approximately 85 percent of all mass in the universe. Unfortunately, despite their best efforts, scientists have not yet been able to detect the presence of a single one, causing some to wonder if they exist at all. That doubt has led some scientists to consider other types of particles as dark matter candidates—one of them is the neutrino, though more and more it appears to be falling from favor. Another is the axion, a particle first theorized in the early 70's. One of its major proponents is Rosenburg, who has been developing experimental devices with the purpose of either proving that dark matter is made up of axions, or it is not. Axion theory suggests that axions can decay into photons—one axion into two photons, and vice-versa—the inbetween state is known as the virtual axion. Because of this property, most axion detectors are dedicated to measuring them after they have decayed into photons because that is something we know how to detect. Rosenburg describes research into devices meant to study the impact axions may have on the sun, or halos around astronomical objects, and notes that super novae should also produce them. He also notes that some experiments are looking into what has come to be known as "Shining light through walls"—the idea being if axions decay into photons just after passing through a wall, or other object, it should be possible to detect them. The problem here of course would be proving that they have anything to do with dark matter. Rosenburg then describes a radio frequency approach, another way to capture axions decaying into light—current experiments in this area are meant to capture axions that are part of the Milky Way's dark matter halo. In this case, the idea is to rouse the axions into decaying into microwave photons and then detecting them—the most prominent project appears to be the Axion Dark Matter eXperiment (ADMX), which Rosenburg claims is likely to either prove or disprove axions as dark matter once and for all. In the late 20th century, cosmology became a precision science. Now, at the beginning of the next century, the parameters describing how our universe evolved from the Big Bang are generally known to a few percent. One key parameter is the total mass density of the universe. Normal matter constitutes only a small fraction of the total mass density. 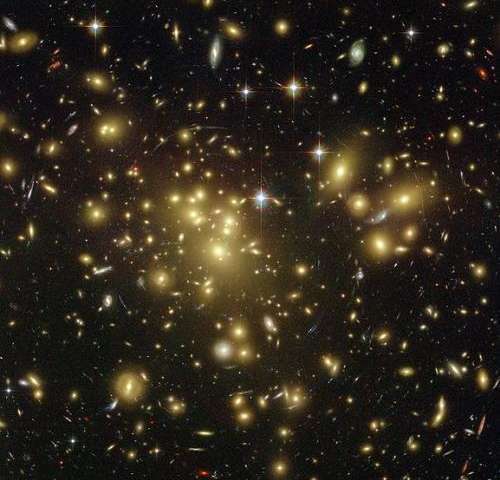 Observations suggest this additional mass, the dark matter, is cold (that is, moving nonrelativistically in the early universe) and interacts feebly if at all with normal matter and radiation. There's no known such elementary particle, so the strong presumption is the dark matter consists of particle relics of a new kind left over from the Big Bang. One of the most important questions in science is the nature of this dark matter. One attractive particle dark-matter candidate is the axion. The axion is a hypothetical elementary particle arising in a simple and elegant extension to the standard model of particle physics that nulls otherwise observable CP-violating effects (where CP is the product of charge reversal C and parity inversion P) in quantum chromo dynamics (QCD). A light axion of mass 10−(6–3) eV (the invisible axion) would couple extraordinarily weakly to normal matter and radiation and would therefore be extremely difficult to detect in the laboratory. However, such an axion is a compelling dark-matter candidate and is therefore a target of a number of searches. Compared with other particle dark-matter candidates, the plausible range of axion dark-matter couplings and masses is narrowly constrained. This focused search range allows for definitive searches, where a nonobservation would seriously impugn the dark-matter QCD-axion hypothesis. Axion searches use a wide range of technologies, and the experiment sensitivities are now reaching likely dark-matter axion couplings and masses. This article is a selective overview of the current generation of sensitive axion searches. Not all techniques and experiments are discussed, but I hope to give a sense of the current experimental landscape of the search for dark-matter axions. Why? Why create a mystery to solve a mystery? Maybe the problem is our approach! Or perhaps DM is just the superposition of the gravitational curvatures of the all the matter in the clusters. Ie. the halfway point on a radial line between two galaxies instead of being zero gravity is just a point where the pull toward either galaxy is the same. The point itself may have a gravitational pull of its own when viewed from far enough away, perpendicular to that point. Not because there is a mass there, but because space at that point is curved. No, it postulates one possible particle--the axion, as a (complete or partial) possible explanation to the undefined place holder--dark matter. Why do you feel the compulsive need to continually spam your vacuum mechanics site? Have you ever made a post without doing so? You're like the Jehovah's Witnesses of science sites. IronhorseA: "the halfway point on a radial line between two galaxies instead of being zero gravity is just a point where the pull toward either galaxy is the same." How would that maintain cohesiveness *within* a galaxy, so that it doesn't spin apart? Losix: "The dark matter particles are detectable easily, they can be also prepared in the lab"
Swordsman: "Dark matter has electromagnetic properties and exists everywhere." If they have electromagnetic properties, are easily detected, why is it then that virtually everything I read about DM describes the inability of science to detect it, except here in the comments sections of articles like this? I hadn't read much about the Axion in the past so this article prompted me to look up other articles on it. I'm certainly not knowdgable enough about particle physics to understand anything in detail but from what I've now read it seems that the Axion would solve a lot of problems and I don't mean "just" the dark matter problem. It wasn't even postulated to solve that problem, it was postulated to solve an issue in QCD. So you have a particle that's theorized to solve one problem and it actually solves the dark matter problem as well. Additionally, the solar coronal heating problem and the seasonal variation in x-rays observed in the atmosphere. It sounds like the axion may be the winner. This article by a scientist studying WIMP's was extremely insightful.